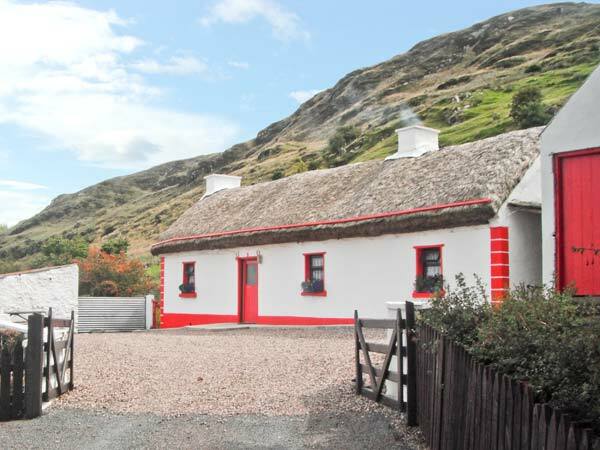 Cronkeerin Thatched Cottage is a charming detached, thatched cottage located in the peaceful countryside and just two miles outside of Ardara, County Donegal and can sleep five people. 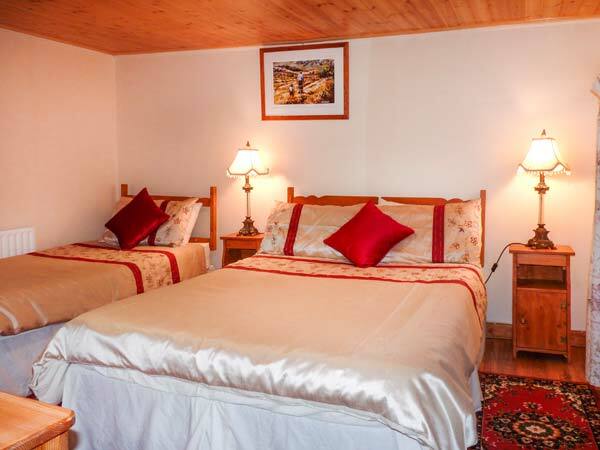 The all ground floor cottage has one double bedroom, one family room with one double bed and one single bed, a shower room and an open plan living area with a kitchen, dining area with a woodburner and a sitting area. 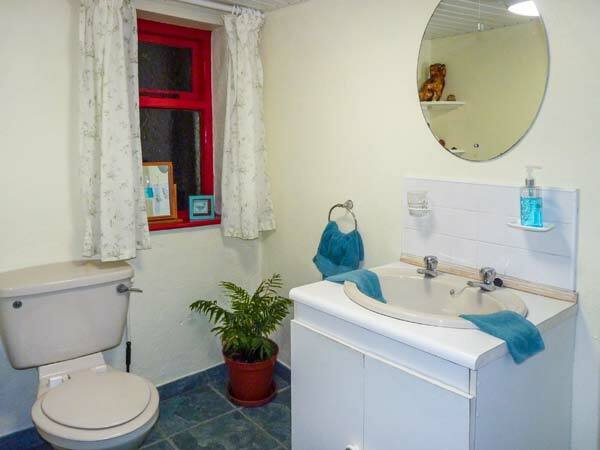 Outside there is off road parking for three cars and a front garden bench, storage shed and a barbecue. 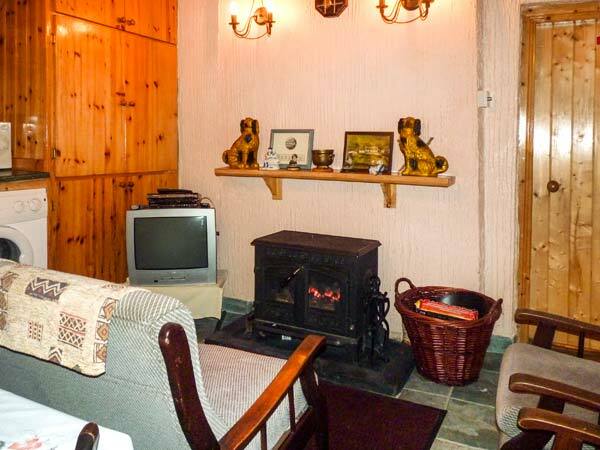 Cronkeerin Thatched Cottage is a wonderful base for your Irish holiday. Foody's is the place to go if on the go whilst in Donegal, located in the centre of the town it is easily found. With the reassurance of knowing that ingredients are sourced from local producers you know you are making the right choice. With a daily homemade soup and a great selection of baguettes, sandwiches and wraps that are made freshly daily you get quality and value. Castle Murray Restaurant is elegant but remains cosy and serene, it has a welcoming atmosphere that immediately relaxes you, this in addition to the superb views from the dining room make for a lovely dining experience. This is further enhanced by the quality and freshness of the food they serve which, is a first class experience. All dishes are created with great care and attention and artistic presentation, it is a feast for all the senses. It is definitely the place to go if you are looking for a unique dining experience, or class yourself as a foodie. The Harbour Restaurant has an enviable location facing the lovely bay in Donegal town. This casual and friendly restaurant has an interesting and varied menu, that makes full use of the local produce including a supply of the best fresh local seafood. Other options on the menu are delicious steaks, pizzas, vegetarian options and gluten free dishes. With its relaxed and casual atmosphere it makes an ideal place to dine. The Mill Park Hotel Cafe Bar is well known for its warm and welcoming ambience, delicious food and great service. In a lovely position with views out over the lovely gardens, this casual and comfortable Cafe allows customers to relax and enjoy their surroundings and the food available. Open for lunches and dinner there is lots to choose from like tasty and warming soups to sandwiches and wraps or for dinner with choices like stonebaked pizzas, pastas, steaks and much more there is something to appeal to everyone's taste buds. Pearl's Place is in a lovely building just a short walk from the heart of the town, it has a warm and inviting atmosphere. Offering casual dining with a blend of classic and modern European cuisine that is prepared by highly skilled chefs. When dining here you are assured exceptional food, wine and service. It is a lovely place to dine and offers great value for money. Maddens Bridge Bar is available to visitors touring Bundoran. This local attraction offers a beautiful view of the Peak, a popular spot for surfers. Patrons can enjoy traditional music performances while throwing back a pint or two. Take time out after a busy day of sightseeing to enjoy friendly atmosphere and good entertainment inside this well-known south Donegal pub! Manhattan Steakhouse is the place to go if looking for delicious food in great surroundings. This casual, friendly and vibrant establishment is bright and airy and has a relaxed atmosphere. Whilst enjoying your surroundings you can indulge in the lovely food on the menu, with fresh and locally sourced ingredients used this shines through in the flavours of the food. Accompanied by lovely presentation and a great selection of drinks from cocktails to wine, it is a great place to go for a delicious meal. The famous Biddy O'Barnes pub is situated along the foothills of the beautiful Bluestack Mountains. Guests are welcomed by the simple exterior as well as the vintage interior which complements the traditional personality of this subtle Irish landmark. Breathtaking views combined with good food and drink make this a must-see landmark! Olde Castle Bar is a traditional Irish bar that extends a sincere welcome to all patrons. In a prime location in Donegal and being a local landmark it is easy to find this delightful bar. There is a warm and welcoming atmosphere and whilst enjoying this you can eat some of the best food around. Ingredients are found from local suppliers and are of the freshest quality producing dishes that are full of flavour. A lovely place to visit for a delicious home cooked meal. La Sabbia is a warm and intimate restaurant that creates a cosy and welcoming ambience with its soft lighting and colours. In addition the staff are friendly and attentive and the customer service is superb. It offers great value for money and the menu has a continental feel. 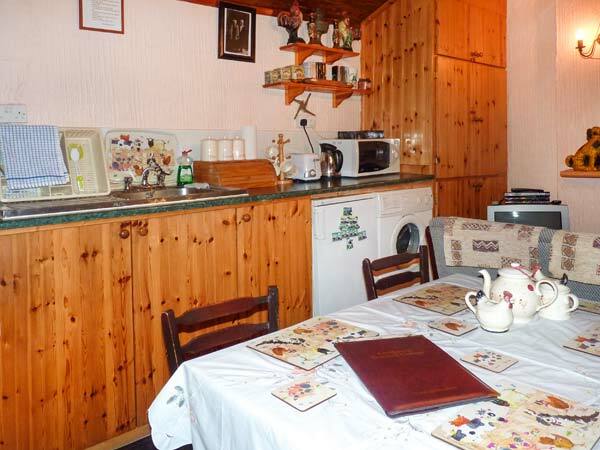 The cuisine is lovely, well prepared, cooked and presented and the portion sizes are generous. There is something on the menu to appeal to all tastes and you won't be disappointed with your choice as the food is always great here. La Sabbia offers a genuine welcome in a cosy ambience with great food and wine, a lovely dining establishment. Fox's Lair Bar and Restaurant is a lovely family run restaurant that offers relaxed dining in a cosy and comfortable atmosphere. The staff are friendly and the customer service is very good. They use only fresh local produce to ensure guests get the best and freshest food, the results are dishes that are delectable and perfectly balanced with flavours and seasoning. The Fox's Lair specialises in steaks and seafood dishes but rest assured everything is tasty and delicious and you won't be disappointed with your choice. The Fox's Lair offers fine dining in a relaxed and welcoming atmosphere with prices that are reasonable making it the ideal dining choice in the area. Leo's Tavern is a lively and bustling bar that hosts music nights were new talent is encouraged. It is a popular family bar in the area and has a warm and welcoming atmosphere, the restaurant is decorated in a country style and contains lots of interesting pieces of memorabilia relating to some famous past performers. The restaurant only serves dinner seven days a week in the peak season May to September otherwise it is just the weekends but, they are open for lunch daily. The food is very good, and the service and staff are great. Once the food is out of the way the entertainment starts and this is when Leo's comes alive. Leo's Tavern is a great venue for a lively evening of food, drink and music and will appeal to all ages. Kee's Hotel holds many accolades for the quality of the food that they produce. With comfortable and informal dining it is extremely popular with locals and visitors and has a strong reputation for producing wonderful food. Open throughout the day from breakfast to dinner there is always a time to suit. The menus are varied and have many favourites all dishes offering great value for money. Or perhaps an Afternoon Tea would be more suitable. A lovely place to come for a tasty meal. Walking and Talking in Donegal is an all-around good time. Enjoy a vigorous adventure that gets the blood flowing and lets the soul soar as you take in the gorgeous views that make Donegal such a unique place. Weekend walks with food, guides and accommodation are offered as well as full week excursions. Narin and Portnoo Golf Club provides a haven for golfers. Enjoy good times as you play through lush green surrounded by breathtaking natural landscape. Don't forget to take a moment to view the serene shoreline and rolling hills that serve as the perfect backdrop during a morning or afternoon round. Get sun, fresh air and a good game at Donegal Golf Club! The Championship Links golf course sprawls across the picturesque Murvagh peninsula that stretches along Donegal Bay. The location also features a bar and restaurant as well as a convenient golf shop. Clubs, trolleys, caddies and buggies are available for hire. Fin McCool Surf School is a must for anyone who loves to get out on the water. Browse the surf shop to find some of the best quality gear or take advantage of Fin McCool's surf and bike equipment rentals. Along with surfing and cycling, this school now also provides exciting supervised stand up paddle tours. iSurf Ireland School of Surfing will help you get the most out of your time in the water. Get the blood pumping a you ride the waves along beautiful Irish beaches. Educational surf camps are offered for children, including two age group options to ensure proper safety and challenge level. Basic to advanced lessons are also available. Gorgeous green and tranquil blue make the Bundoran Golf Club an excellent choice for golfers in Ireland. Located in Donegal, the course offers relaxed views of beautiful natural landscape as well as an elegantly designed club house. The facility includes an on-site pro shop and an upstairs area with full bar and plenty of room to relax. Get ready to ride at the Donegal Equestrian Centre! 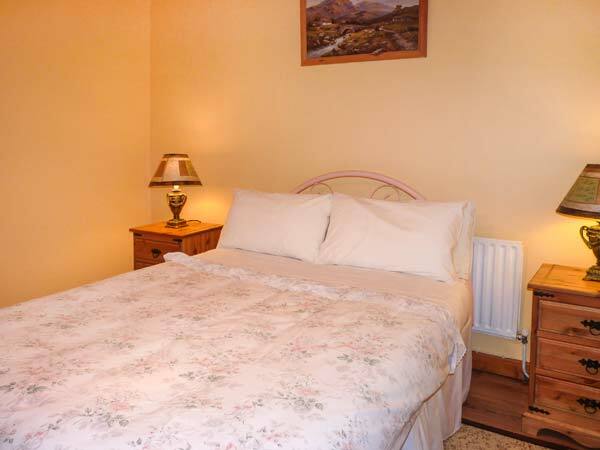 This facility is located just one mile from the middle of Bundoran. Visitors can sign up for riding lessons or schedule treks on horseback. A wide range of horses and ponies are housed here to ensure that every guest has a comfortable mount that matches their individual needs. Bundoran Surfworld is the place for adrenaline junkies who like to get wet. Here, visitors can sign up for surf lessons. Current offerings include everything from junior and beginner lessons to more advanced improver sessions. Don't worry about packing a board because Bundoran also provides equipment rental services. Interested individuals and groups should reserve equipment in advance. Teens and adults are invited to go on an adventure with Donegal Adventure Centre and Surf School! Teen camps help young adults learn about Irish heritage through four week classroom sessions with trips to important sites like the Glenveagh National Park, Hill of Tara and Galway City. College students can discover a unique opportunity to study abroad and participate in Irish cultural programmes. Reach higher elevations with Unique Ascent. This exciting rock climbing and hill walking opportunity provides visitors with a new way to see the Irish landscape. Whether you prefer sunrise or sunset walks through Donegal park, guided walks or something more intense, you will find it here. Donegal sea stack climbing expeditions are also offered. Adventure awaits with Selkie Sailing! Visitors can sign up for a number of fun water-based activities. Take a trip along the shore aboard a kayak or learn how to build a functional raft as a team. Selkie Sailing also provides wind surfing and island camping excursions for individuals or groups. Cormorants, Dippers, buzzards, jays and many other avian inhabitants.This glacier-made land feature is a popular landmark in County Sligo! The Maritime and Heritage Visitor Centre in Killybegs is a great place to begin your exploration of County Donegal. Discover the carpet factory which once employed hand knotters to create the highly sought Donegal carpets. See the largest hand knotted loom in the entire world as well as the largest fishing fleet in the country. Kilcar Fleadh is an exciting event that is hosted in the village of Kilcar. The festival spans an entire week of fun and activities. Listen to authentic Irish music complete with dancers that help accentuate the upbeat atmosphere. Unique displays featuring crafts and heritage items will also be available. Visitors should check the Kilcar Fleadh calendar to find out what will be on when they stop by. Discover the amazing world of traditional hand weaving at Studio Donegal! This fascinating attraction is a family-run business that manufactures high quality garments and accessories. Nestled in Kilcar village, the studio includes visible workspaces with skilled craftsmen that are more than happy to share information and advice on hand weaving. Glencolmcille Folk Village also known as Father McDyer's Folk Village Museum is a replica of an Irish rural village and offers an insight of what life would have been like in the past 3 centuries. Located in an Irish speaking area, the village is designed, built and maintained by locals. Don't just look at the water, journey across it aboard the Donegal Bay Waterbus! This 160 seater watercraft provides stunning views of the seal colony thriving on Seal Island. Passengers can also snap photos of the Bluestack Mountains and many other gorgeous natural settings. Modern amenities are located onboard, including a fully stocked bar, upper deck viewing area, cushioned seating and toilets. Celebrate the life and achievements of one of Ireland's most famous singers, Daniel O'Donnell! The Visitor Centre by the same name offers a rare collection of memorabilia and information that can't be found elsewhere. From Daniel and Majella's wedding attire to his finest stage outfits, there's much to explore for music fans. Take time to visit the tallest sea cliffs in Europe, the Sliabh Liag Cliffs. You will get to see these majestic cliffs from a different perspective. You will be taken aboard the boat to as near to the shore as it can so that you can delight in this marvellous sight. Generally tours take about one and a half hours and incorporate many amazing sights. You may be lucky enough to have company on your trip, in the form of the local wildlife, dolphins, whales, seals and even basking sharks, in addition there is a large variety of bird life in the region. Perhaps you might take a dip in the crystal clear waters of the numerous coves visited on the tour. If you feel the water might be too cold for your liking wetsuits are available. It is a truly amazing experience for all. The Fintown Railway is recognised as County Donegal's only operational railway. The track lies along some of the most breathtaking scenery near Lough Finn. Observe dramatic mountain landscape that is more than eye candy: it is also a land rich in folklore, history and myth. Take the three mile return trip which traces the shoreline along Loch Finn. 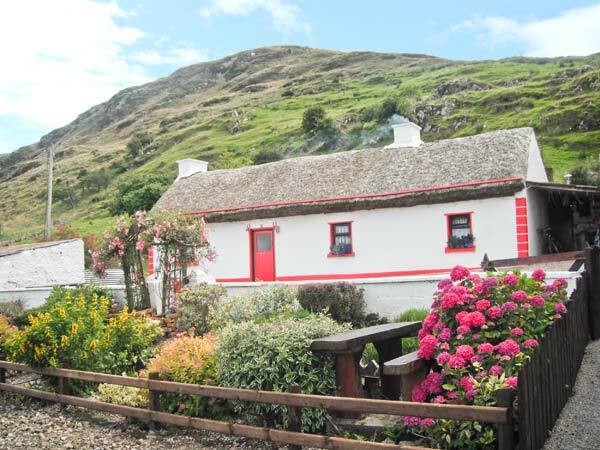 The outstanding Sliabh League Cultural Centre is located on one of the tallest sea cliffs in Europe and boasts an intriging history. It incorporates a craft shop, art gallery and cafe. Operated by a husband and wife this family operated business strives to provide the best service to its customers. The Ti Linn Cafe stands out predominantly for the fact that it serves artisan cuisine that connects Irish traditional and contemporary tastes. The craft shop contains a great choice of crafts knitwear and gifts from local and Irish artists. The centre provides a range of archaeological breaks and day tours to choose from. Conal McIntyre's artwork includes an array of impressive impresionisstic and abstract pieces that are inspired by the picturesque and idyllic coastal scenery surrounding West Donagal. Conal's creative pieces can be seen online, but to appreciate the full beauty of each piece it's highly recommended that you instead see the paintings at the Glen Gallery and the garden studio. The Bundoran Glowbowl bills itself as the "largest family entertainment centre in the north west." This attraction offers the excitement of bowling with 8 lanes and computerised Tenpin bowling. An amusements complex is also included with fun for all ages. Try the pool tables, air hockey, football tables, dance machines and multigame touch screen machines! Catch waves with the Bundoran Surf Company! Visitors who want more sun and surf in their trip should check out the surf school provided by Bundoran. A wide range of challenge levels are offered from beginner to improver. Younger surfers can sign up for junior surf school sessions. Equipment rentals are offered. Get the kids ready for fun and excitement at Dizzy's Den! This colourful, family-friendly facility includes an extensive indoor play centre designed just for the little ones. Let the kids spend an afternoon climbing rope bridges, mingling with wobbly dinosaurs and making noise with the interactive sounds equipment. Older children will love the football and basketball area available on the top floor. Waterworld Bundoran is a great place for families and visitors seeking some wet and wild fun! The facility has a lot to offer swimmers, including a wave pool with five unique wave patterns, two speed rapids, slide pool with tornado and twister flumes. Child-friendly features are available as well as Ireland's fastest water slide - the Whizzer. Get ready to ride at the Five Oaks Ranch! This County Donegal attraction offers trail riding packages. The facility also hosts seasonal events such as team penning, cutting and cowhorse. Clinics are also offered and cover various aspects of horsemanship. Visitors can expand their equestrian knowledge while having a great time at the ranch! Inishmurray Island is a remote expanse that rests four miles off the Sligo coast. The setting is almost mystical and serves as a wildlife sanctuary as well as an important religious site for Christians. Visitors can admire the work of Mother Nature in its purest form and explore the remarkably sound ruins of the St. Molaise monastery that was constructed during the 6th century. Traditional style and fascinating designs makes Belleek Pottery Ltd. a must-see for visitors in northern Ireland. This attraction contains one of the oldest potteries still in operation in the world. Guided tours are available so guests can see firsthand how genuine Irish pottery is crafted using age-old techniques. The building also houses a lovely gift shop and tea room. Holiday Horse Farm invites Ireland travellers to take a holiday on horseback! Mounts are available for riders of all skill levels so no experience is required. Numerous paths are available including the Donegal and Sligo trails or you can take a journey along the coast to feel the wind in your hair and the sea at your side! The Falcarragh Visitor Centre provides a wealth of information on the history and ancestry of the local area. This Gaeltacht region (Gaelic speaking area) includes a blend of stunning natural landscape and traditional manmade settings. Visitors can delve deeper into the heart of Ireland by exploring its people and past. Amazonas Outdoor is the place for sportsmen and nature lovers. This facility offers gear for a wide range of exciting outdoor activities. Enjoy a hiking or camping excursion or go on a fishing trip. Adrenaline junkies will love to test their skills at airsoft or archery. Amazonas has it all from protective gear to lures, bows, arrows and much more! The grave of W.B. Yeats can be found inside Drumcliffe Graveyard. Yeats is a well-known Irish poet who chose the location to be his final resting place. The surrounding area includes many gorgeous views, such as the Benbulben mountain. The grounds include the remnants of a round tower and high cross. Donegal Tours Day Tours provide visitors with a simpler way to see it all in Ireland! Don't feel lost as you navigate the country on your own. Multiple tour options are provided so guests can choose something that matches their purpose or personal preference. Experience culture and history on the heritage tour or see Giants Causeway or the Inishowen Peninsula. Donegal Castle is a vital piece of Irish history. Constructed during the 15th century, this landmark offers a unique way to delve deeper into local heritage while getting a closer look at strong Irish architecture. Guided tours are offered. Video and photographs are welcome so make sure you bring a spare memory card! Join the faithful on a pilgrimage to gorgeous Lough Derg. This three day our features barefoot walks and hallowed beds intended for kneeling while in prayer. Special events are hosted throughout the year, including retreats, meditation, afternoon outings and unguided tour days. Reflect on and celebrate Celtic spirituality with your feet planted on this lush island sanctuary. Moygara Castle is the site of an ongoing research project dedicated to studying history and architecture. The structure dated from the 16th and 17th centuries and includes a square bawn, residential tower and gatehouse. Visitors can follow progress as it becomes available on the project at the castle's official website. Glenveagh Castle sits among some of the most breathtaking Irish landscape any visitor has ever seen. Enjoy the nearby gardens and nature centre or take in the audio visual presentation to learn more about the history of the area. The grounds include organic beauty as well as modern conveniences such as the castle tea rooms, restaurant and a gift shop. The Lissadell House and Gardens is elegant both outside and inside. From marbled pillars and hardwood flooring to gorgeous architecture and lush stretches of green, there is much to see here. The location has been the focus of extensive restoration efforts which began after approximately seven decades of neglect. Today this landmark is one of the most breathtaking in the area. The Glebe House and Gallery in Letterkenny is a charming place rich in history. Visitors will love the nearby woodland gardens. The grounds include beautiful Japanese and Islamic art as well as classic William Morris textiles.See 300 amazing works of art by some of the 20th century most celebrated artists, including Kokoshka and Picasso. Cloghcor Tomb is identified as one of the finest portal tombs in Sligo. Positioned at the top of a hill north of Drumcliff bay, this enormous stone structure includes two large portal stones, two basins and a unique double holed stone. Ogham script appears on a smaller stone. This landmark is remarkably well preserved.